Carnival Corporation the world's largest leisure travel company, today announced it has signed a shipbuilding contract for a third next-generation cruise ship for its rapidly growing AIDA Cruises brand, the leading cruise line in Germany, which is the largest and fastest-growing cruise market in Europe. Scheduled for delivery in 2023, the new 180,000-ton ship, being built by leading German shipbuilder Meyer Werft GmbH at its shipyard in Papenburg, will include an estimated 2,700 staterooms and extensive selection of popular onboard features. Featuring Carnival Corporation's exclusive "green cruising" design and the marine industry's most advanced fuel technology, the ship will also be fully powered at sea and in port by Liquefied Natural Gas (LNG), the world's cleanest burning fossil fuel, which will significantly reduce air emissions. With today's announcement, AIDA Cruises now has a total of three LNG ships on order. 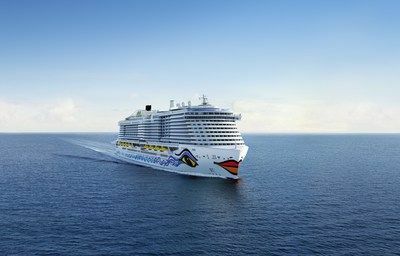 AIDAnova is scheduled to join AIDA Cruises' fleet in December as the first ship of its new generation of LNG vessels, and the first-ever cruise ship in the world to be fully powered by LNG. The second ship of this series will be christened in the spring of 2021. The three next-generation LNG ships for AIDA Cruises are part of Carnival Corporation's ongoing fleet enhancement strategy with 20 new ships scheduled for delivery between 2018 and 2023 – creating excitement in the vacation market and continuing to exceed guest expectations while accelerating demand for cruising, the fastest growing segment in the vacation industry. "On board our ships, which travel the most beautiful destinations worldwide, we offer the greatest holiday variety on the German market with a complete package of culture, entertainment, sports, wellness and culinary delights," said Felix Eichhorn, president of AIDA Cruises. "The interest in AIDAnova, the first ship of our new generation, is enormous, even before the commissioning later this year. With today's new shipbuilding contract, we will ensure the further growth of the cruise market in the long term and will be able to provide excellent cruises for this steadily growing holiday segment in the future as well. Thanks to an even wider variety on board, we are opening up completely new possibilities for attracting new target groups across generations for this unique holiday experience." Starting with AIDAnova, the next generation ship class will combine onboard innovations with evolutions of successful product features already offered on the existing fleet to further enhance the guest experience. More than 40 restaurants and bars on board provide guests with an opportunity to enjoy a new level of world-class dining experiences and culinary trends. Versatile entertainment offerings include an enhanced theatrium, an onboard TV studio and new event restaurants. Guests also have the choice of more than 20 different cabin types – from the penthouse suite to generously sized family staterooms or single staterooms with a balcony. With its three new LNG ships on the horizon, AIDA Cruises continues to pursue its pioneering mission of "green cruising" and sustainable operations. As of 2023, more than half of AIDA Cruises' guests will be spending their vacation on a cruise ship that runs fully or partially on LNG. The use of LNG for ship power prevents emissions of particulate matter and sulfur oxides almost entirely at sea and in port. It also significantly reduces the emission of nitrogen oxides and CO2. Tim Meyer, managing director of Meyer Werft, said: "This is the 10th AIDA Cruises ship we are building in Papenburg, emphasizing a long-term partnership between AIDA Cruises and Meyer Werft. AIDAnova and the following two sister ships feature the latest technology focused on sustainability and energy efficiency." In total, Carnival Corporation has agreements in place with leading German and Finnish shipbuilders Meyer Werft and Meyer Turku to build nine LNG-powered cruise ships across four of its nine global cruise brands with delivery dates between 2018 and 2023 – three for AIDA Cruises with expected delivery dates between 2018 and 2023, two for Costa Cruises with expected delivery dates in 2019 and 2021, two for P&O Cruises UK with expected delivery dates in 2020 and 2022 and two for Carnival Cruise Line with expected delivery dates in 2020 and 2022.